Released as a free PDF, this gave the gaming community an opportunity to read and play the game and comment upon it before the release of the final version the following year. 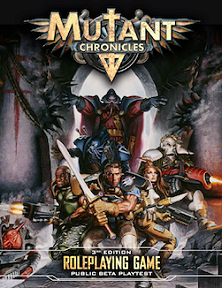 Publisher's blurb: "The Beta Test version of Mutant Chronicles contains the V5.0 Beta rules developed by Jay Little to get playing quickly, and an introductory adventure, Straffar Gatan 39, written by me, sci-fi noir author Gunnar Roxen. It is set during the first days of the conflict with the Dark Apostles (in the Dark Symmetry period). Can your players solve the mysterious disappearance of the residents and bizarre happenings in the crumbling tenement before it is too late?"